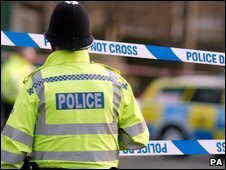 Eighteen forces reported increases in the category of "most serious violence"
Domestic burglaries rose 4% in England and Wales during the third quarter of 2008, official figures indicate. The Home Office statistics show robberies with knives or sharp instruments also rose, going up by 18%. Drugs offences rose, but total recorded crime continued to fall - dropping 3% over the three months to September. The statistics come after the Home Office named 18 police forces involved in a miscounting row over some incidents of serious violence. According to the British Crime Survey - a mass study of the experience of the people surveyed rather than reports to the police - the risk of being a victim of crime remained at 23%. Within that, the level of overall violent crime was said to be stable. But crimes recorded by the police showed significant increases in some key areas, including home break-ins, knife or sharp instrument-related violence, and drugs. The rise in burglaries was the most significant in some years. Recorded firearms offences fell by 29% between July and September 2008.